Old town of Ipoh is forever bustling with activities come morning until evening, a nostalgic part of Ipoh that’s far from forgotten, and no doubt a dream come true for all food lovers on a gastronomic trail; From north to south, and vice versa. The one that started it all …. 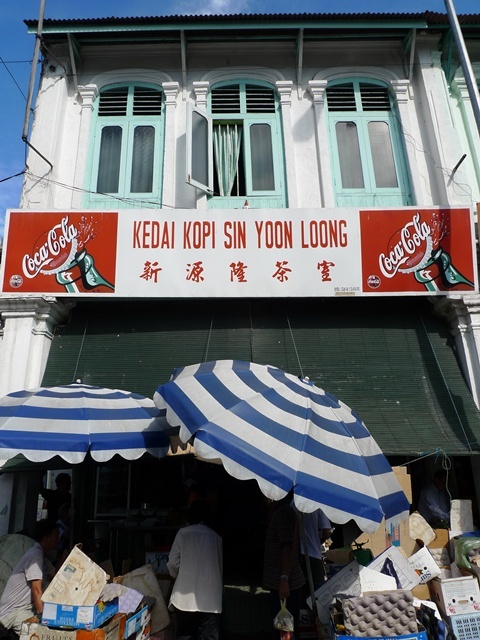 Previously, I blogged about Sin Yoon Loong white coffee, the oldest joint serving the now legendary white coffee of Ipoh. 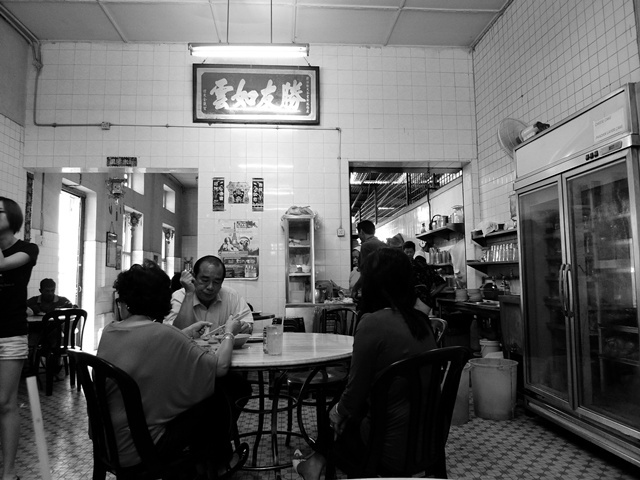 Though no doubt Nam Heong, or rather, Old Town White Coffee (those Kopitiam outlets that are mushrooming everywhere) is responsible for putting Ipoh’s white coffee on the map, both domestically and internationally. Sin Yoon Loong has been in business probably in my past life. Right until today, they’ve managed to retain the authenticity of their forte; the white coffee brew, a secret handed down from generations to generations. Realise that having breakfast in Ipoh’s Old Town can be a stressful endeavour. Searching for an empty parking lot is one, while fighting for a seat is another. Thankfully, the row of white coffee shops consists of 3 shops in a row, and Nam Heong on the opposite side. So there is backup after all. All this while, I never had a full meal at Sin Yoon Loong. Only coffee and toast. Or their famous “Kai Dan Kou”, or egg-flavoured roll with kaya. The Chee Cheong Fun passed the test, at least to Mr Z anyway. He of course, was comparing to Sin Lean Lee’s version, which is nothing to shout about in the 1st place. 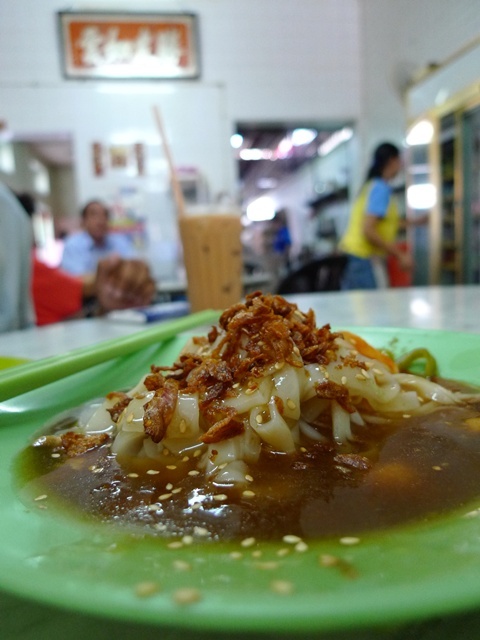 Sin Lean Lee is the coffee shop with that infamous stall serving Kam Chau Fan aka GOLDEN Fried Kuey Teow. 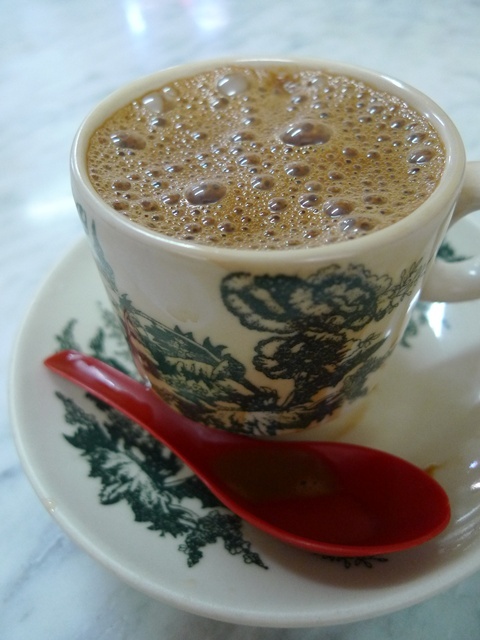 A hot, frothy cup of good old Ipoh’s white coffee. THE original taste. But nothing beats spending precious time chatting away with acquittances over a cup of rich, and fragrant white coffee. Feeling peckish? 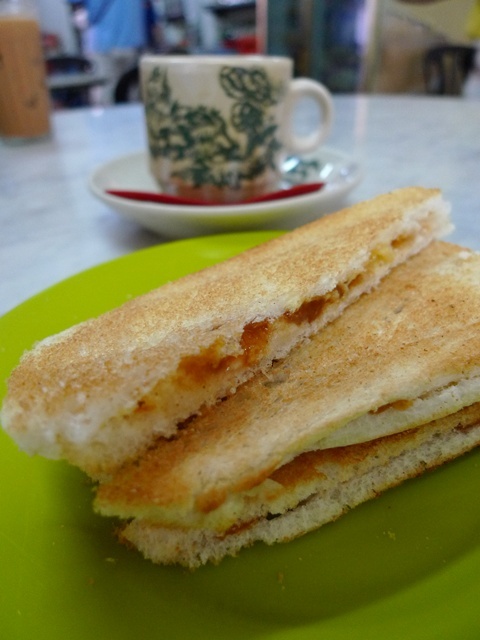 Order a serving of toast, buttered yet not overly cloying although substantial ‘kaya‘ (coconut jam) is spread on the thin slices of crisp bread. Location : Sin Yoon Loong @ Jalan Bandar Timah, 30000 Ipoh, Perak. The corner lot, before reaching the towering 20-storeys flat of Old Town. But what IF you’ve waited for hours (slightly exaggerated, but you get my drift), yet you found NO empty seats? And with your craving for a shot of caffeine at an all-time high; runny nose, jittering teeth, sweat beads forming on the temple and all? 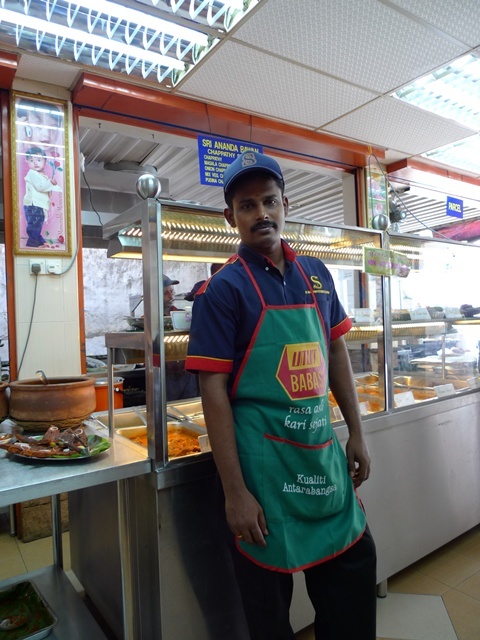 Another one of those famous banana leaf outlet in Ipoh …..
A hop and a skip away, you’ll seek Nirvana. Your light at the end of the tunnel. Your solace, your requiem, your COFFEE. @ Sri Ananda Bahwan Restaurant. The sweet Indian desserts of Ladoo, Palkova, and Mysore pak. Spelling may be off though. So you’re wondering what’s Madras coffee? 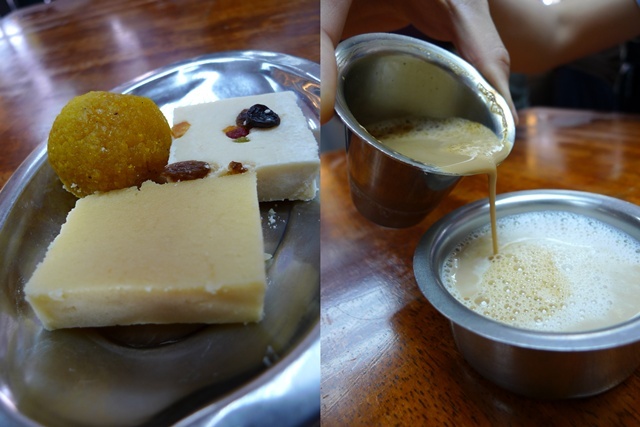 Also known as Indian Filter Coffee, not many might have heard, let alone tried this saltish, milky brew. I for one, was completely oblivious to its existence until duly notified by a reader. Firstly, you gotta know how to drink it. 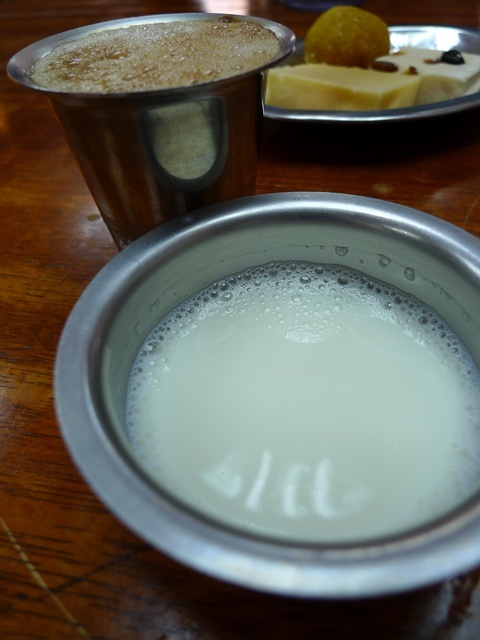 Yup, you’ll be served with not one, but TWO separate steel container, a cup with the thick & frothy coffee, and another smaller steel bowl of fresh cow’s milk. Tastewise? Not too strong to jolt up that draggy system in the mornings, but pleasant and smooth, with a tinge of saltiness. There’s a faint hint of herbs/spices which is not overwhelming, but leaves a fragrant note after you slurp down a mouthful. Not bad, definitely a beverage I’ll come back for. The desserts at Sri Ananda Bahwan were not sickeningly sweet, unlike most. The Palkova or milk sweet in particular, is creamy, soft and sweet enough to leave a lingering taste, yet not tooth-numbing terror. The ladoo was disappointing though, Samy‘s was far better. Location : Sri Ananda Bahwan @ 7, Persiaran Bijeh Timah, 30000 Ipoh. It’s the row of shops perpendicular to Sin Yoon Loong. Turn right at the crossroads with Nam Heong and Sin Yoon Loong, and you’ll see this shop on your left. SO, WHICH ONE’S RIGHT UP YOUR ALLEY? The food and drinks look so good! I really want to try the white coffee… wonder why it’s called white but the color isn’t white. this post very deja vu la…didnt you blog once about wanting to have kopitiam and ended up having mamak? I will go for the white coffee. Have tasted a few in pg but most of them have not reach to its similarity. but i do like my masala tea.. I am pining for Ipoh food but I am going to have a busy instead of a long weekend. Sad to say , none. Because both are hypes and too far from the scale of the golden brew , even the lowly mis-ranked toddy in Teluk Gong beats them coconut down ! But we have to give due credit to the power of Old & Ipoh's other real offerings , some of which you have corrected flattered ! and the thing is, makan places like these usually serve good food as well! beats some wannabe cafes, anytime! i likez! Never have Indian dessert b4 but I heard that they are very sweeeeet~~? I’m so trying Sin Yoon Loong when I’m in Ipoh! Given a choice, I’ll definitely try madras coffee and the desserts, or kuih. Hmm…I’ve acquired a taste for Indian cakes and would nip to Little India come Deepavali to hunt around for some sweet cakes. Yummy! I love Ipoh’s version of CCF… Either the plain one with sesame oil or the mushroom sauce. yum yum. Looking at the food makes me miss Malaysia so much. Aww… How I wish I can have those food as breakfast now! not bad still could post an article!madras coffee..hmm wonder wat was i doing all these while in ipoh..will give it a try.the dessert with raisins..i think it’s not mysore pak..that’s for sure..sorry ya.have to figure out:)and by the way..ur macha will be so proud to see himself here.:)! Never tried Chee Cheong Fun with Mushroom Gravy and Madras Coffee bfr.. wish to taste it,Mmmm..
wow…the Madras coffee looks so special! any tea/ coffee with cow’s milk wins me over 🙂 love creamy thick drinks..
hey, check out today’s Sunday Star… You’re in it. Congratulations!!! Wow,i missed reading that on Sunday Star. Congrats..you are now famous :)) do write about it and share with us. my hubby, jason saw you in the Star too, congrats! anyway, we’ve discovered a good white coffee in Menglembu. Is definitely better then those name that you’ve mentioned in this post…heee. I’ve never tried the Madras coffee before. Interesting! Can you find it in KL? For now, I’ll stick with the Sin Yoon Loong White Coffee. Btw, this shop is also found in KL right? on curry pig’s skin chee cheong fun, no less. LOL. I’ve linked this post of yours on Sin Yoon Loong’s signature Kai Da Kou to my blog post on ‘Steamed Sponge Cake’ on 2/8/10. Perhaps you may drop over for a visit! Hi cheah, will sure do.